I think one central thread would be good to have everyone post a pic of their car and the offsets they are running. I know I like the look of a more flush offset (lower) and on my previous car I ran a extremely low offset (17 front and 35 rear) to poke the wheels. I am trying to decided what the optimal offset would be. I posted all the oem wheel info there, including offsets. I was going to throw a pic of my old STI up, but Photobucket is not working. Either way I had a semi aggressive set up with 18x9 advan RG II's. I'll be selling those in the spring and getting something for the C.
Thanks, this is basically what I was looking for. Can people please start posting more pictures and specs of wheels. I am looking at 18's vs 19's. I am looking to run the lowest offset as possibly ( mid to low 40's) and probrably around 8.5-9 inch wide. Also I am creeping on the H&R supersports right now. Show me what you have!! 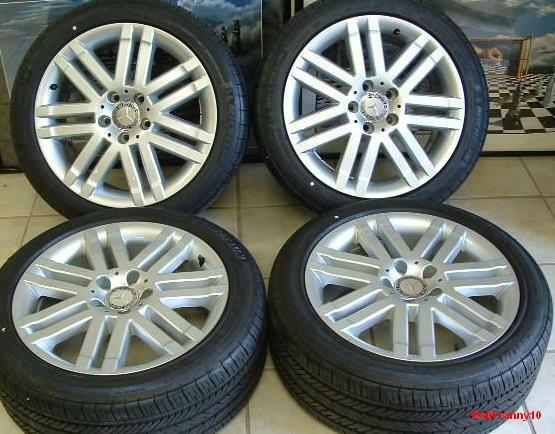 Another question I have been having a hard time to track down was the exact offset of these wheels. This is a good thread idea, unfortunately, my stock 17's have no place here... Though I would like some pics! Those look like the 2009 stock 17" wheels. If so, and staggered, 47 on the front 7.5" wheel and 58 on the rear 8.5" wheel. 100% what I was looking, for great start. This thread is officially doing bad things to me... Hiding the credit card immediately! Last edited by stogge; 01-13-2011 at 10:32 PM. I definitely like the lower offset wheels on the c3. Its almost to flush with higher offset wheels, it looks nice when the wheels come out a little. More aggressive. Will 8j with ET42 be fine on W204? The wheels will be 4mm in towards the center line of the car then this setup. I like to use this offset calculator to find what is going to happen to the wheels. It;s a lifesaver. Great thread that can def be of some help! BUMP! And noob ?, what is ET? Very good info! Thanks for the clarification!